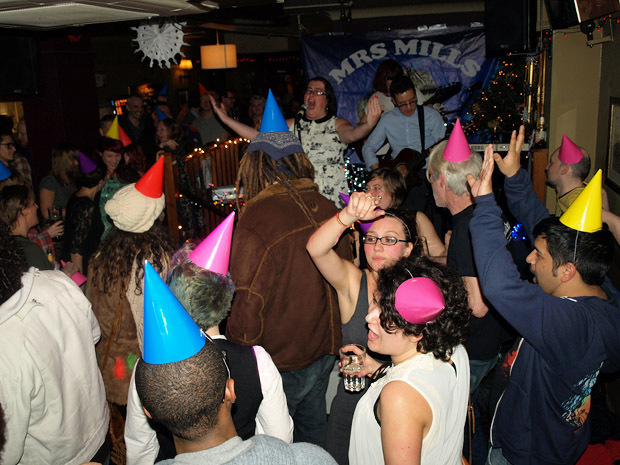 Rolling out a barrel of irony-untroubled, hipster-free, good time entertainment, the Mrs Mills Experience is made up of an unlikely combination of Brixton-based dance DJs and punk musicians, united by their improbable love of piano-thumper extraordinaire, Mrs Gladys Mills. 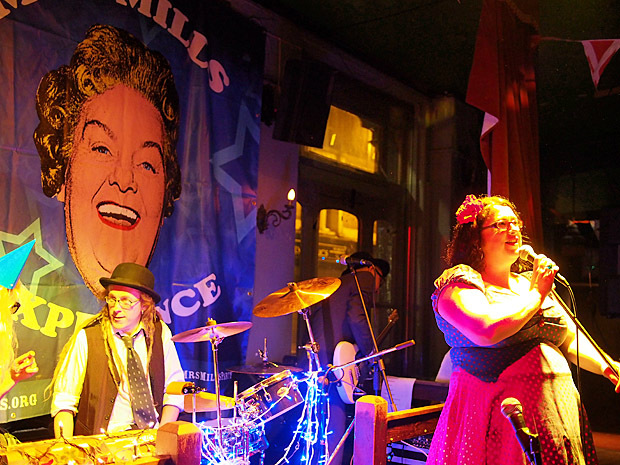 Delivering a variety pack of authentic, working class singalong tunes, the Mrs Mills Experience aims to make the audience the star, unleashing a salvo of good time music for these austerity stricken times. Such was the buzz behind this new outfit that a prestigious Saturday night slot at this year's Vintage Festival was secured - without the band even recording a demo! - and the BBC will be filming them over the summer for a forthcoming documentary. Keen to bring the might of Mrs Mills to the masses, the band have embarked on a small tour of unconventional - some may say confrontational - slots at various venues around London. 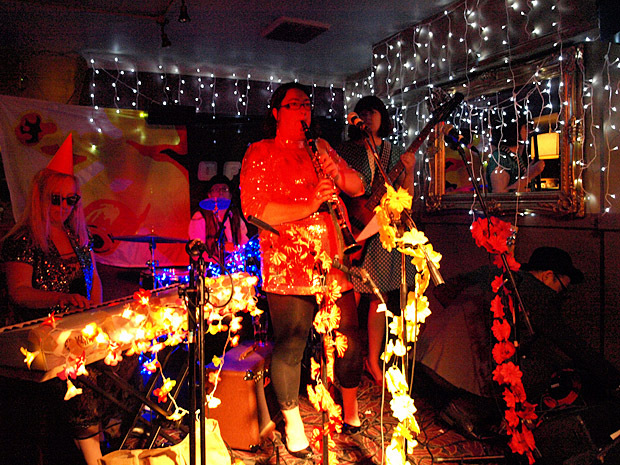 The band's debut was on June 1st 2012 at the hugely popular Offline Club in Brixton. Playing to a packed crowd, the band roused the crowd to sing along to music hall classics, while party hats were handed out to get folks in the mood. Accompanying the Mrs Mills Experience on selected songs onstage were a trio of ukulele players from the Dulwich Ukulele Club [see photos]. 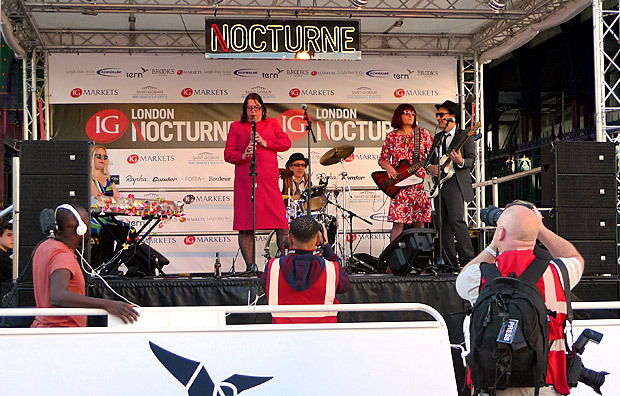 On Sat 9th June, the band played their first festival show on the main stage of the London Nocturne 2012 at Smithfield Market, Farringdon. 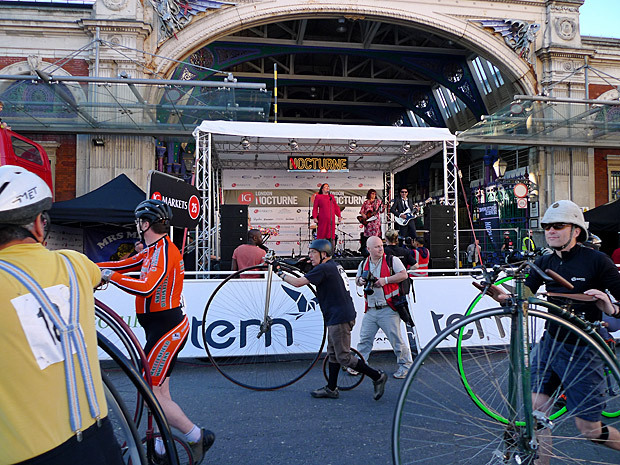 The first live band to ever play at the popular Nocturne event, the Mrs Mills Experience provided musical accompaniment to the exciting Penny Farthing bike races [see photos] and were featured on Channel 4's coverage. Next up was a date on the river, when the band took over the Tamesis Dock boat on the River Thames on Thurs 21st June, with all-girl go-go troupe The Actionettes providing the moves in a nautical themed evening of entertainment. Music website BrixtonBuzz gave the show a rave review, commenting: "With the audience cheering, laughing, singing and dancing along ...this was a great gig, by a great band...". 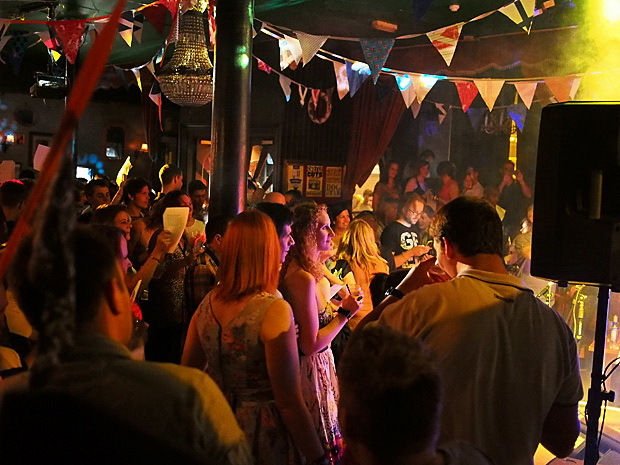 In late June, the band played their biggest show, bringing the full Mrs Mills honky-tonk pub piano thunder to Brixton's legendary dance venue, The Dogstar on Saturday 30th June. Clubbers were treated to the unexpected spectacle of the Mrs Mills Experience in full flight, performing in the middle of a packed dance floor at midnight. "Just brilliant. 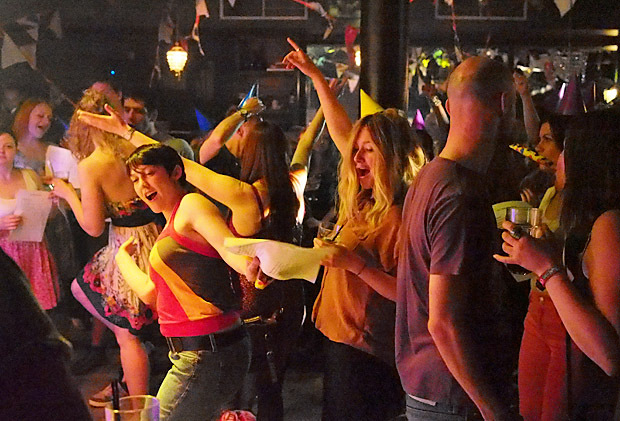 Better than a million indie bands put together..."Imagine 350 ravers going nuts for "roll out the barrel" and you're half way there - this is something you need to check out - it's unlike almost anything you're unlikely to see... just a brilliant night." Unfortunately, the band's Saturday night slot at this year's Vintage Festival in Northamptonshire fell victim to the festival's late cancellation, so another show was scheduled at the Offline Club in Brixton, where the BBC came down to film the event for a documentary. It was a very wild night indeed! 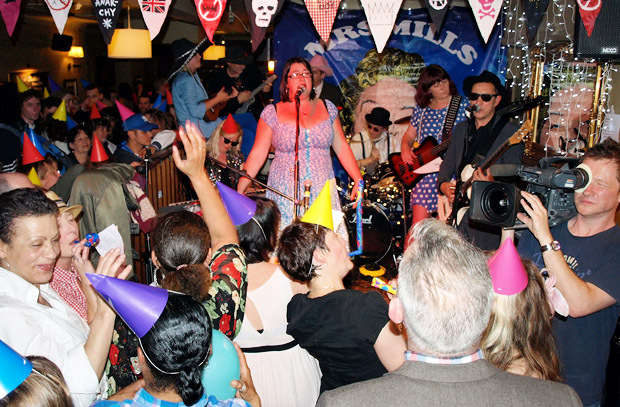 In September, the Mrs Mills Experience headlined a show at the legendary Duckie Club at the Royal Vauxhall Tavern in south London. The band played to a packed house, and went down a storm, with the crowd singing along with gusto and positively demanding an encore! In October, we played a Day Of The Dead show with our friends the Dulwich Ukulele Club, and a couple of weeks later we were asked by TV's Mary Portas to play the Roman Road east end street market to be filmed for her Channel 4 TV show. We ended a busy year playing a Christmas special with Glam Chops (featuring the legendary Eddie Argos from cheeky indie popsters, Art Brut), before returning to Brixton to play our own festive singalong special at the Offline Club. In April 2013, we supported the music hall legends Chas and Dave in Brighton, with headline dates following at the London Nocturne and Camberwell Arts festival in June 2013. 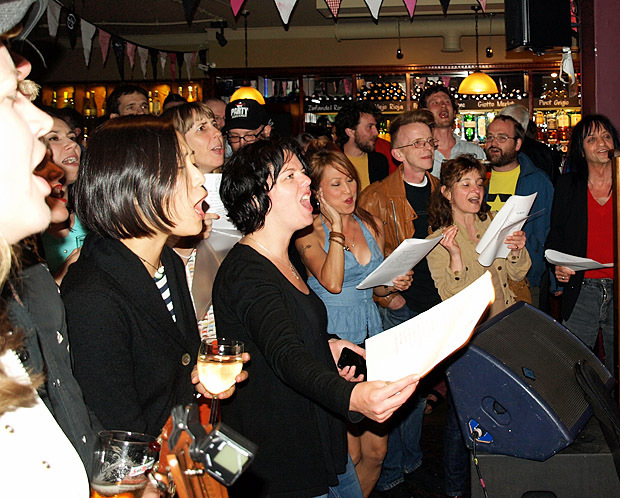 The band took a break, but returned with two riotous Christmas shows in south London in December 2018, with fans singing along to the old favourites at the Effra Social and Railway Tavern in Tulse Hill. 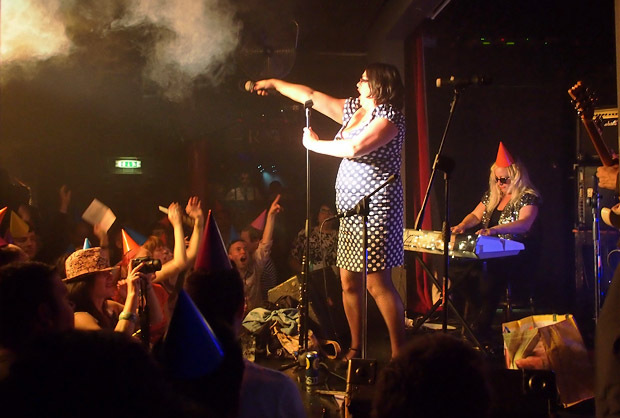 March 2019 saw the triumphant return of the Mrs Mills Experience at Vauxhall's legendary gay club, Duckie, where the band were welcomed back by a wild crowd. See details of our forthcoming shows here or you can contact us on this page.